How does Speaking mode work in vocab lists? 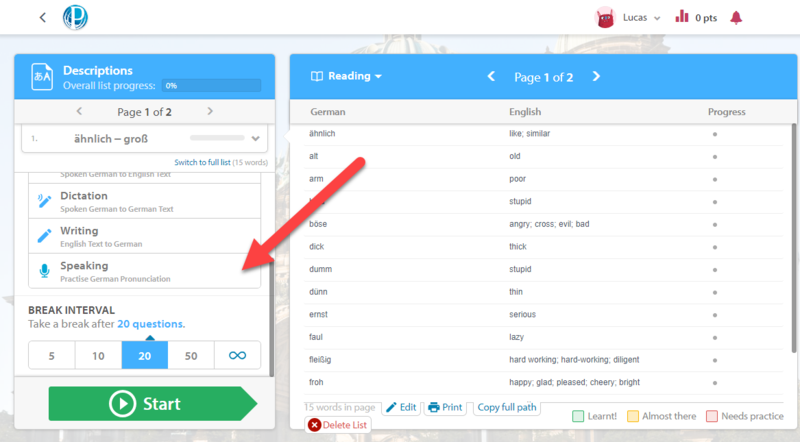 Speaking mode for vocab lists allows students to record themselves as they practice their spoken language skills on any existing LP vocab list. Speaking mode reduces the pressure of speaking in the target language with model answers and instant self-directed feedback. Speaking mode is automatically available for all vocabulary lists where the words have sound files attached to them. Speaking mode currently can't be assigned as an assessment, but we're working to make it possible in the future. Also, if you assign speaking mode as homework, you won't be able to hear recordings of students' voices yet. When students first start the test, they will need to do a quick microphone test to make sure the system can hear them. Ensure that students click Allow when asked for permission to use the microphone. If there are any problems with the test, see Why can't I record my voice? The word or phrase will be shown on screen in the target language. To respond, students need to either hold down the record button or press and hold the spacebar, then read out the word/phrase. Once they've recorded their voice, we play the model answer from a native speaker for them to compare themselves to. Students can replay either recording as much as they like by clicking on the Model Answer or Your Answer buttons, and can re-record as many times as they like by holding the spacebar or clicking and holding the record button again. When students are finished practising a word, both independently and by mimicking the native speaker, they click I've got this! to move on. Alternatively, they can click Come back later to try a different word. Because speaking mode is self-assessed, no points are allocated for completing questions; it's just a great way to practice pronunciation skills in a non-threatening environment.